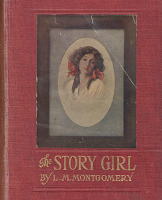 The Story Girl is frequently mentioned as being Lucy Maud Montgomery's favorite story out of all of the books that she read. However, what frequently is not pointed out is that she made the aforementioned statement back in 1917. When writing a series of articles for Everywoman's World she proclaimed that she felt like The Story Girl was her best piece of work. Since then it seems to be heralded as a "must read" as holding a special place in Montgomery's heart and no doubt it did. But I don't think it should have kept that label (and be advertised as such) unless she restates it somewhere else because following that remark she went on to write an additional 13 novels and many short stories. I don't feel like declaring The Story Girl to be her favorite - but certainly one of her better loved tales. It is, however, easy to see why it would be. The popular television series, Road to Avonlea , is based on The Story Girl and its sequel, Chronicles of Avonlea . I plan on doing a blog post specifically on the Road to Avonlea series so I will refrain from discussiong that at this present moment. This book details the story of the King family on Prince Edward Island. Two city boys, Beverley (through whom the story is told) and Felix are sent to live with their cousins on Prince Edward Island for a season. (Who would name a boy Beverley?) They spend their time on the Island in the delighted and delightful company of their cousins Sara Stanley (aka The Story Girl), Dan, Cecily, and Felicity. They also pal around with hired boy Peter Craig and friend Sara Ray. The children are primarily under the care of their Uncle Alec, Aunt Janet with occasional references and oversight provided by and Aunt Olivia and Uncle Roger. (If you've ever watched Road to Avonlea these names should be sounding awfully familiar to you!) I confess I had a hard time getting into this book because the screen versions of these characters are so firmly entrenched into my consciousness that I had to spend a great deal of time sorting out how everyone is actually related in Montgomery's original stories! However, the book is lovable in that it takes you along on adventures lived by a group of children who get into the most awful scrapes with the best of intentions. They truly mean to go about doing good but somehow or another sawdust ends up in the pudding, they confess every sin believing Judgement Day is upon them, and get into fist fights over who can eat sour apples without making a face. Along the way the children are spell bound by The Story Girl who has the most magical voice of anyone they have ever met. She has a way with words that Montgomery writes about as not being able to properly capture or describe with mere words. In short, The Story Girl is something of an enchantress, able to hold her listeners spell bound to the best and worst of tales, lores and legends. Although The Story Girl is a rather remarkable character and does win the title of the book, she wouldn't be half as interesting without the other King cousins surrounding her. It is the way that the children play off one another that makes the book so engaging. However, it is very clear that The Story Girl was the character that Montgomery most believed in and admired. She is almost absolute perfection and you can't help but speculate that Montgomery was trying to create a literary face to describe her own person. This book is Montgomery's attempt to explain childhood fantasies to an adult population. It was a revisiting of some of her childhood days and beliefs with an attempt to make her thoughts a bit more clear for the grown up mind who has long since left its imaginations behind. In short, this book is about kids using their imaginations for fun and it sometimes getting the better of them. It's a great book and I'm glad I included it in part of my own L.M. Montgomery Challenge reading list. Ah, yes, I need to go back and re-read this one, too. I used to watch Avonlea on the Disney child when I was a teenager. I loved it, but alas, I've just about forgotten much of the details of the screen version, as well. I do remember liking the aunts especially, though. I'm 2/3 through Story Girl for the umpteenth time. Loving the cousins all over again. teachmom: Netflix has the first season. Amo. I hate to say it but I struggled to get through this book. I was bored to tears with it. After my twitterpations with Anne of Green Gables I was disappointed in The Story Girl. But I appear to be the only one ever to think this way. Oh well. Beverly was originally a boy's name, as was Lesley, Valery and a number of others that we now associate with girls. At the time that LM Montgomery was writing, Beverly would have been known as a boy's name.